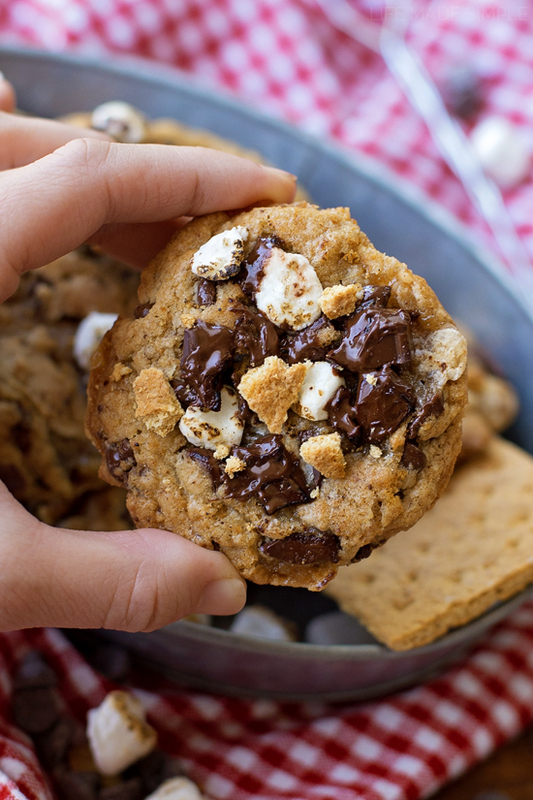 These gooey s’mores chocolate chip cookies are perfect for summer! 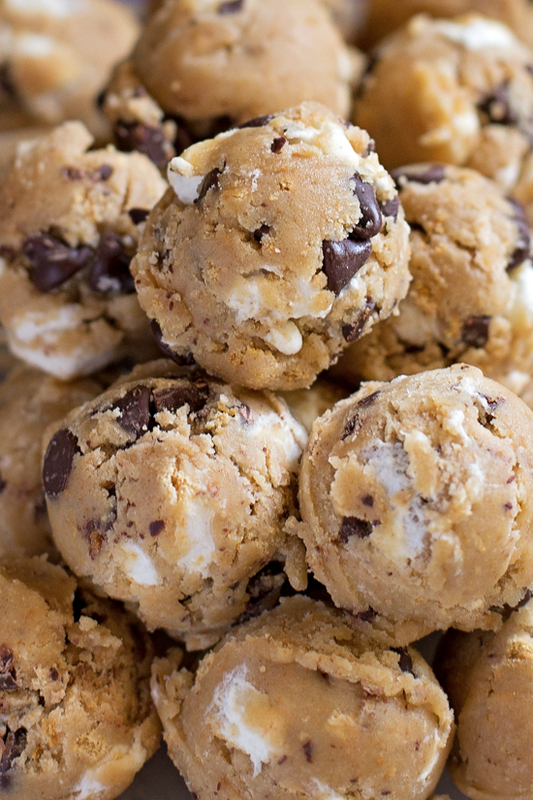 They’re everything you love about a s’more, minus the campfire! I used a standard chocolate chip cookie base, but folded in some finely ground graham cracker crumbs to give these cookies a little extra flavor. Such a good idea! Then I quartered some mini marshmallows so that there was just enough in the dough to get that caramelization when the cookies baked, but not enough to make the cookies flat and funky. Along with the mallows I added some coarsely chopped chocolate so that it would get really melty inside. Yumm!! 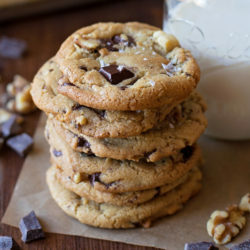 About half way through baking, I removed the cookies and pressed some marshmallows, graham cracker chunks and chocolate chunks on top, then returned the cookies to the oven. This allowed the marshmallows to puff up and turn golden brown without melting them and it allowed the chocolate to get soft. Once the cookies cooled off for a few minutes, they were devoured! 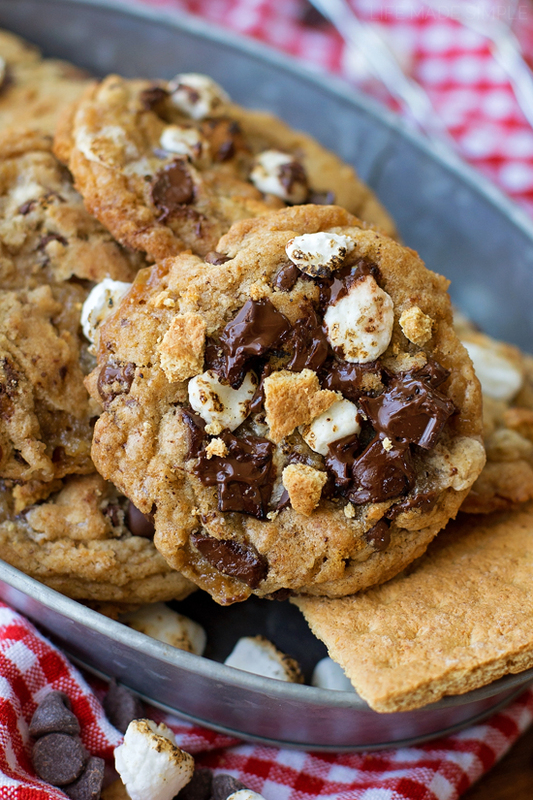 These s’mores chocolate chip cookies were a huge hit with our family. I hope they’ll be a hit with yours too. Enjoy & happy baking! In a large bowl, whisk together flour, graham cracker crumbs, baking powder, baking soda, and the sea salt, set aside. Quarter ⅓ cup of the mini marshmallows (I used kitchen scissors), fold in the marshmallows, chocolate chips, and half of the chocolate chunks and any "shavings" you may have created while chopping the chocolate. Place the dough into an air-tight container and chill for 3 hours, preferably 24. The longer the dough chills, the better it tastes. I chilled mine for 72 hours. Using a standard size cookie scoop (1.5 tablespoons) place dough onto the prepared baking sheets (12 per sheet). 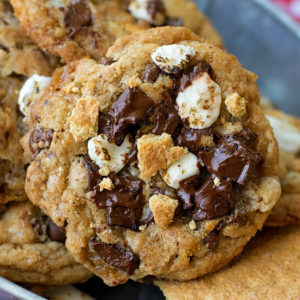 Place in the oven to bake for 6 minutes, remove and press in some marshmallows, chocolate chunks and graham cracker chunks. Return to the oven and bake for 5-7 minutes or until golden brown on the edges and lightly golden brown on the tops. 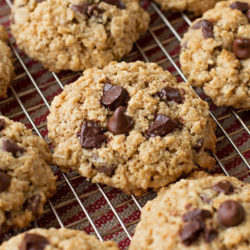 The cookies should look a little soft in the centers but should not be doughy. Remove from the oven and allow to cool for 5 minutes on the sheets before transferring to a wire rack to cool completely. - If you want your marshmallows extra toasty, try using a kitchen torch! 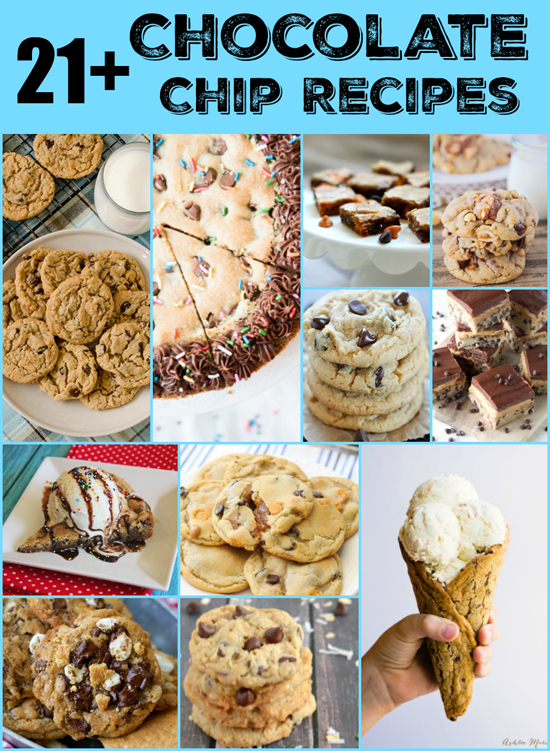 Chocolate Chip Cookie Pizza – Jamie Cooks It Up! White Chocolate Coconut Cookies – Jamie Cooks It Up! I’ll take the dough! YUM! 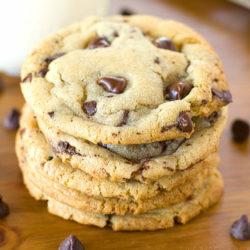 Wow, these look so delicious! I would maybe add some sea salt on top to give it a sweet and salty combo! Love it!! Yes, that would make these extra amazing! !